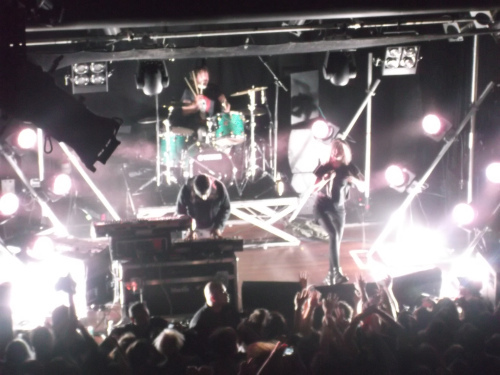 [Review] Crystal Castles @ The Studio, Auckland 15/01/13 | Shut Up Hamish! Crystal Castles came to The Studio in Auckland last night, bringing their unique brand of electro/goth/punk and managed to make the night feel simultaneously like a party and the end of the world (probably an end brought on by man’s self-destructive ways). Or to be not so abstract, it was an intense and intimate show, with Alice Glass and Ethan Hall putting in their all for the modest Auckland crowd. Tensions mounted before the band took the stage as an eclectic crowd quickly filled up the small space in front of The Studio’s stage. The entirety of Joy Division’s album closer was played through the P.A. speakers leading up to the band’s arrival, which I personally felt was a perfect album to accompany what was to come. I love this album and Crystal Castles’ dark goth rave fits perfectly with the depressing but hypnotic art-rock of Joy Division. I’m not sure everyone around me felt quite the same way, as there were restless yells after each song, with one group even starting a chant out “We’ve got work”. Apparently an Auckland crowd’s not to animated on a Tuesday night. That was until of course, Crystal Castles took the stage. Opening with ‘Plague’, the crowd immediately erupted into a surge of activity with Ethan’s synths set to 11, accompanied by Alice’s violent, piercing, unmistakable screams. I personally love this track and let the surge of the crowd take me into the thick of the mosh, where I stayed for the rest of the set. The wall of sound was accompanied by a live drummer, adding an human feel to the processed drums and rows of lights which filled the stage. Initially the lights were used minimally, with only flashes of blue being used at times as Ethan, Alice and their live drummer stood nearly in darkness on the club stage. Gradually more lights were introduced until the stage became cloaked in strobing white light. The intensity did not let up as they launched into ‘Baptism’ and ‘Suffocation’ off the 2nd album. ‘Wrath of God’ provided a moment to cool down before the band launched into what was unsurprisingly a highlight of the set, ‘Crimewave’. ‘Crimewave’ saw the crowd engage in the most prolonged period of pogo-ing, and also in the most enthusiastic sing along of the night. Alice disappeared onto the floor of the stage during this section and didn’t reappear until what I think was ‘Alice Practice’, another highlight, with it’s particularly aggressive beat spurring the crowd on to mosh some more. Photo taken from http://13thfloor.co.nz. Hope that’s ok dudes! The moments that Alice threw herself into the crowd were highlights, with fans scrambling to get a touch of Alice in the flesh. On one occasion she caused the entire crowd to collapse, the entire pit swaying to the right side of the stage where she stood precariously on top of a multitude of hands. This did not stop her from returning into the crowd a few songs later, which at thing point I was very near the front of the stage so had the pleasure of helping to hold her up on top on the crowd. Her energy as a frontwoman and efforts at interacting with the audience in moments like this rivals other great front people I’ve seen live, such as Peaches and Iggy Pop. Their cover of ‘Not In Love’ ended the initial set and at this stage I was sweaty, exhausted but satisfied. After a brief break the band returned for their encore, three more songs beginning with ‘Intimate’ from II and ‘Sad Eyes’ from III. I hung in there till the end, although the jumping around on my end had stopped a few songs back. Last song of the night, the epic ‘Yes No’ from the first album gave us one last aggressive blast to savour and I managed to muster the energy to thrash around for another few minutes. Alice descended upon the crowd one last time, the crowd managing to keep her stable this time. She swung her microphone into the crowd upon finishing the songs vocals, and although I’m not entirely sure but something very hard hit me in the side of the head just after that moment, which I’m guessing was the microphone. I have a jagged red bruise in that spot to prove it. The band left the stage over a wall of feedback and noise. 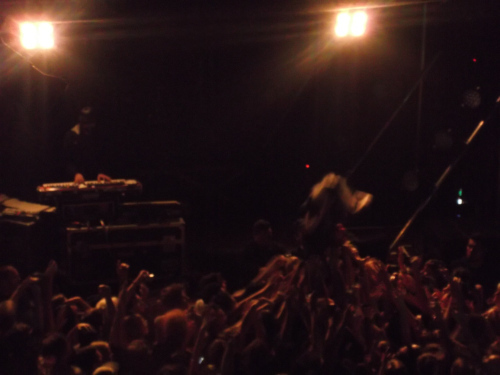 The crowd was still amped and crowd surfing continued after the music was gone and the stage was bare. Which probably means it was a really good gig. It seemed a big generous set as more than often bands seem to give in New Zealand, even in the small club venues. Perhaps they were putting in their all after their last show here at the Big Day Out 2011, which was hampered by sound issues and Alice’s leg in a cast limiting here performance. Or perhaps they were just riffing off the crowds intensity (or at least it felt intense from where I was). Probably though, they’re just a really great live band. Even though Auckland has a huge gap in it’s festival calender now that the Big Day Out has left us, sideshows such as this from BDO artists do more than a little to fill the space until that festival or something equivalent returns.